Now on our travels, we’ve experienced our fair share of walking tours — and honestly some of them we would do 10 times over … and others — we would never consider doing again! Food: Walking food tours are a plus for us. You’re undoubtedly going to work up an appetite doing all that walking and with a food tour, you’ll have multiple stops to refuel and the costs will already be included in the price (of course bring extra if you’d like to purchase other things). We really enjoyed our food tour in Puerto Vallarta. Read more about it here. Smaller Groups: Okay, many tours will have a cap on group size in order to keep the experience intimate and enjoyable. This is a good thing. We’ve been the only people on a tour before and we’ve been on tours with more than a dozen people. The preference is always a smaller group where we can befriend the other participants and move more efficiently (less people to keep up with). Our Culture: Being African-American women, it’s always wonderful going on walking tours that either appeal to our culture or discuss our history. The Black Heritage Trail tour we did in Boston is a great example. Read about it here. Cool Landmarks: Sometimes a walking tour can be a visit to a particular landmark and then walking around and exploring said landmark. This was the case in Mexico City with our day trip to Teotihuacan. Once you see the beauty of the massive pyramids, the thought of being tired goes out the window and you just have to climb to the top. After lunch, the tour resumed with us looking at historical landmarks in the city. Read more about our experience on that tour here. 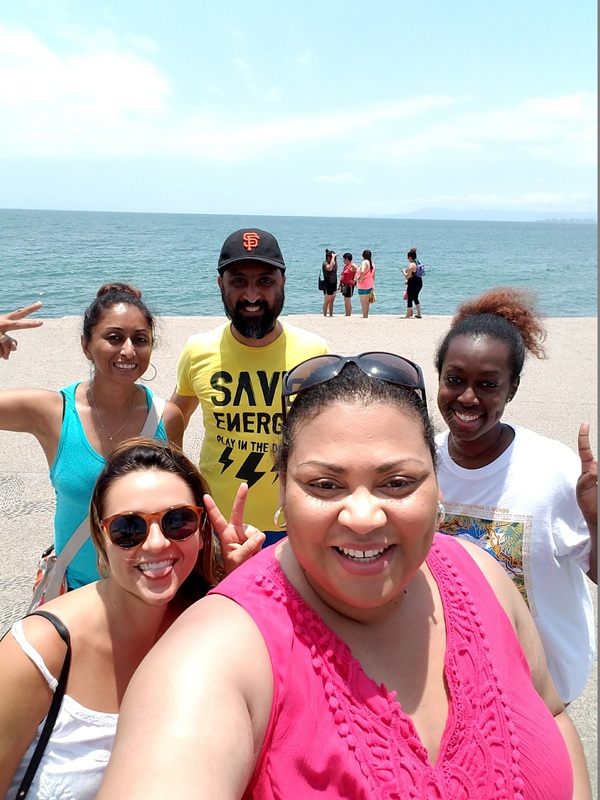 Group selfie with our new tour buddies in Puerto Vallarta! Too Crowded: Too many people on a walking tour (we’d say more than a dozen) just lends itself to people having trouble keeping up, the tour guide having to yell so everyone can hear (and the people in the back still can’t hear) and the tour participants getting in the way of the locals and residents who are simply trying to navigate their own town. The Damn Heat: Houstonians, picture a hot and humid summer day in August where the low temperature for the day is in the 90s. Now picture walking around in it for two hours. Get the idea? Yeah, walking tours in areas with miserable heat are just a no. Period. Strict Tour Guides: As a tour guide, we feel like you have three responsibilities (1) educate people (2) keep tourists as safe as possible (3) make the tour enjoyable. That being said, please do not rush through landmarks and not allow us to take pictures of stuff we deem interesting. We’re travel bloggers for goodness’ sake. We take pictures! It’s pretty irritating when you try to sneak in a picture and look up to see that the tour is half a mile ahead. Foolery: We really can’t describe this any other way. One particular tour we recall had adults dressed up in ridiculous outfits for no good reason. To top it off, we questioned the validity of the “facts” they shared during the tour. Listen, we had to sneak away from this tour early and take shelter in a nearby Starbucks. Yes, it was that bad. So there you have it. Again, these are our feelings on walking tours. It really all comes down to your preference. So tell us what you think. Do you enjoy walking tours? Or can’t stand em? Let us know in the comments.